I have always had great interest in the exploits of climbers on Mt. 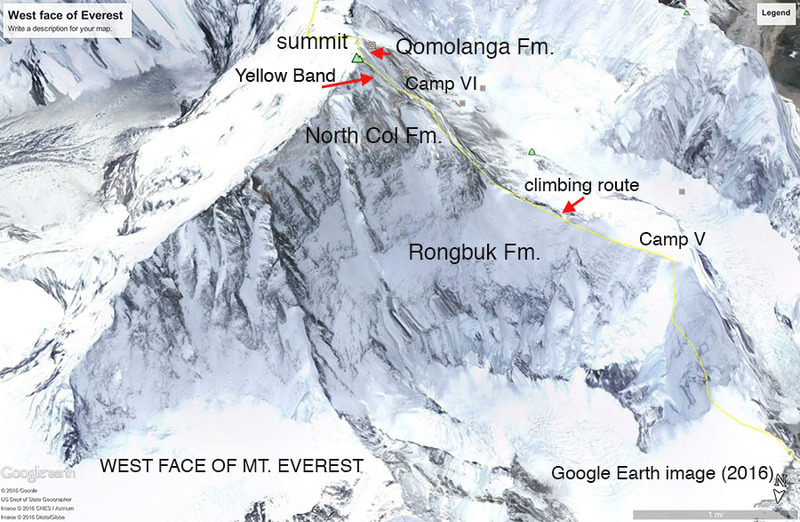 Everest (29,029 ft. [8,848 m] high, according to Google Earth), especially concerning any attempts to do geological and paleontological field work on the mountain. This post is a summary of some of their key findings. I strived to make the text short and keep the jargon at a minimum. Some of the more technical terms are linked herein to Wikipedia. 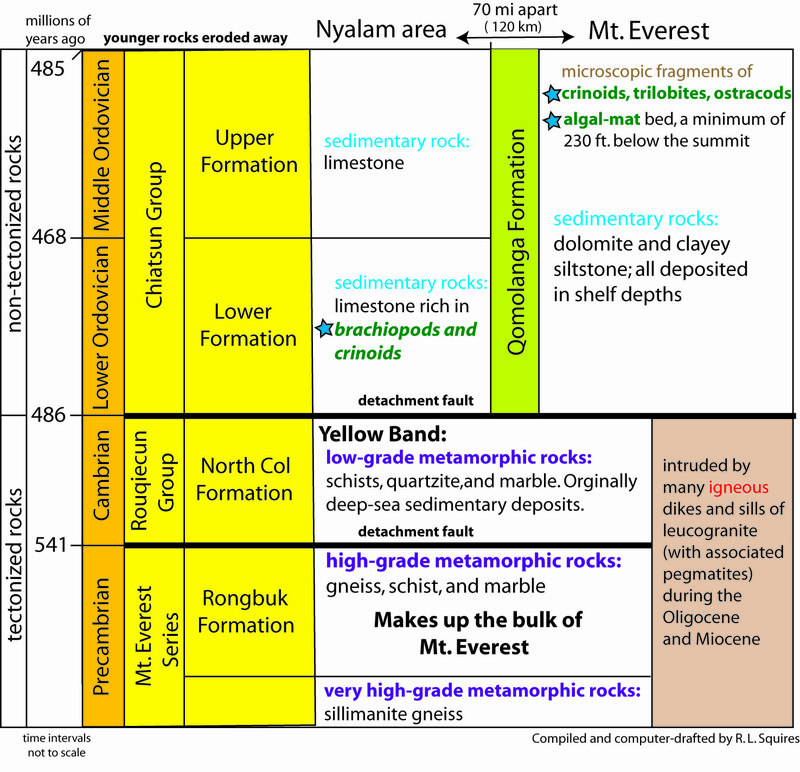 Because the geology of Everest is complex and the fossils are important to the story, it was necessary to make three posts (two consecutive posts will be coming next). In the image above of the west face of Mt. 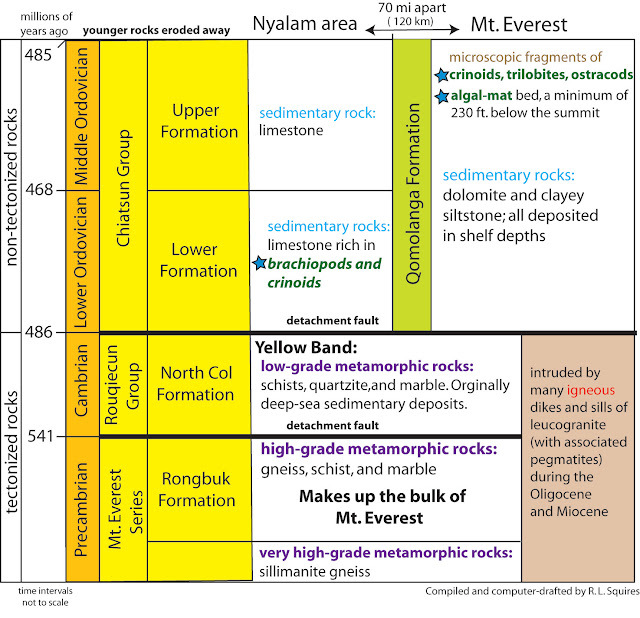 Everest, I attempted to delineate the three main rocks units of Mt. Everest, as well as some of the famous Camp Sites used by many climbing expeditions. A fourth rock unit, which is at the base, is difficult to locate on available images of the mountain. The fundamental geologic and paleontologic data are given in the following diagram. The Nyalam area will be discussed in my next two posts. The Everest story began during the Precambian, with the formation of high-grade metamorphic rocks (sillimanite) forming deep in the earth’s crust. Then came the ripping of India from a large continental mass in the Southern Hemisphere. About 60 million years ago, as India moved northward, it reached near the southern edge of Asia, which was adjacent to a wide ancient, tropical sea called the “Proto-Tethys Sea,” where Paleozoic and younger sedimentary deposits accumulated on top of older, metamorphic rocks. Eventually, the leading edge of India collided with Asia, and part of India was forced underneath Asia. The collision took place in what is known as a subduction zone. In the process, Asia started to be uplifted, and, by the way, this uplift is still going on at the rate of 0.16 in/year [4 mm/year], further pushing the “roof of the world” ever higher. Mt. 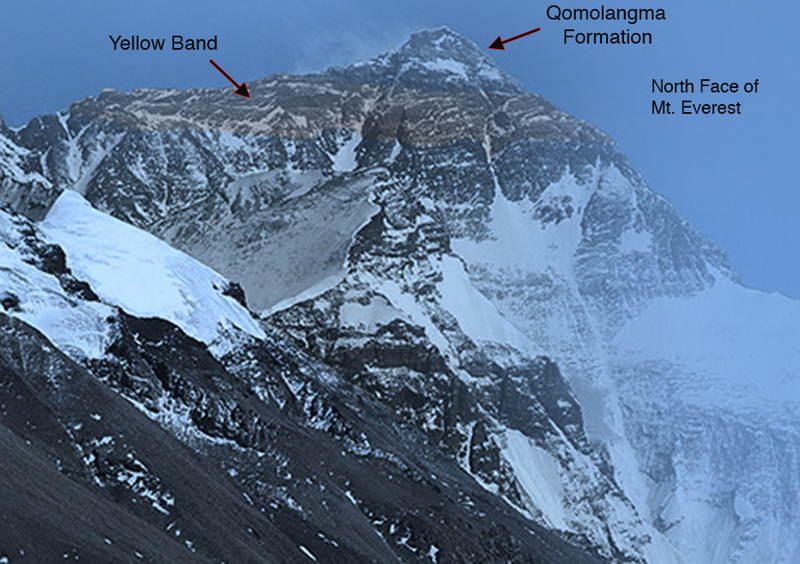 Everest is also moving to the northeast at about 0.12-0.24 in/year [3-6 mm/yr]. Recent satellite-radar imagery proves that Mt. Everest is now 2.5 cm lower than it was before the M7.8 in Nepal last year in April. 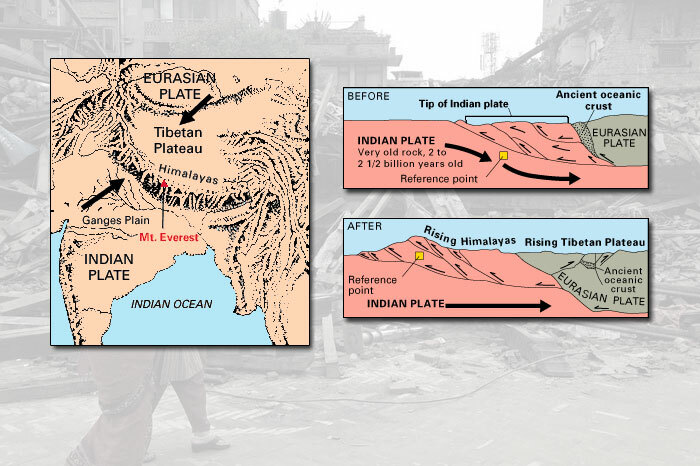 During that quake, Katmandu, the capital of Nepal, rose nearly three feet, and there was a horizontal shift of up to 7 ft. in the general area. 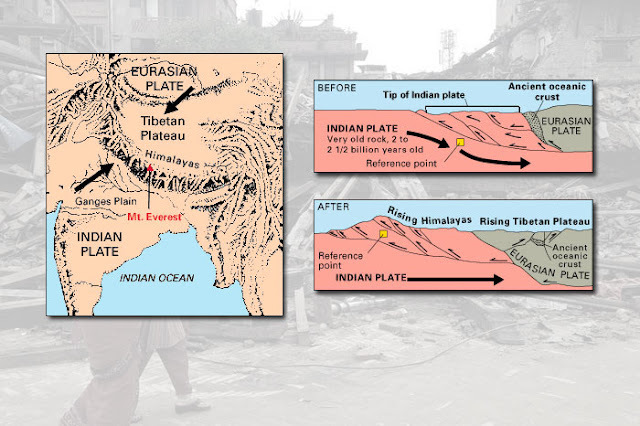 All five images shown here are from an excellent website, which depicts all aspects of the collisions, etc., of tectonic plates. Click United States Geological Survey for viewing. The “Yellow Band” consists of about 560 ft. (172 m) of marble that has weathered a distinctive yellow-brown. It can be readily seen in the next image. The "Yellow Zone" is overlain by the Qomolanga Formation (the small-looking, pyramid-shaped succession of strata.) The name "Qomolanga" is derived from the Tibetan name, meaning "Mother Goddess of the Earth," in reference to the original name for Mt. Everest. Image modified slightly and annotated from the webpage This webpage has an excellent historical overview and also a good read of Mallory's 1924 Everest Expedition. The marble (originally deep-sea sedimentary rock) of the "Yellow Zone" contains some very poorly preserved (recrystallized) “ghost fossils” of crinoid fragments. The North Col Formation (including the "Yellow Zone" is separated from the Rongbuk Formation by a a low-angle fault known as a décollement or “detachment fault.” The Qomolanga Formation is separated from the North Col Formation by another detachment fault. It has been postulated that when the tilting of the mountain took place, slabs of it slide down and over the immediately underlying rock. Think of it as having a pile of several very thick bundles of shingles on top of a house and then the shingles slide downward. Any one shingle bundle that slid is no longer in its original location. So, even though the rocks units are stacked, they DO NOT represent a continuous sequence that formed in the same place. The slabs, however, did not move a huge distance. After this last-mentioned detachment fault, during the Oligocene and Miocene (24 to 20 million years ago), there was further friction generated by the collision of the two continents. This heat melted older rocks, which created magma, which rose upward and intruded into the now vertically stacked (thanks to the detachment faults) into the sillimanite, Rongbuk, and North Col rock units. The Rongbuk Formation was severely affected by the rising magma, and this is when the leucogranites (light-colored without any dark minerals) and high-grade metamorphic gneisses and shists formed. The fourth main rock unit of Mt. Everest is exposed near its summit. It is a sedimentary rock unit, which formed elsewhere relative to the older rocks. These “summit sediments” accumulated in shallow depths, and their rock unit is called the Chiatsun Group (= the time correlative Qomolanga Formation of Ordovician age), The Chiatsun/Qomolanga rocks are the ones that contain recognizable fossils. These will be discussed in my third post. Most of the rocks near the summit of Mt. Everest have not been well studied, for obvious reasons. Many of the outcrops are in the so-called “death zone” above 25,000 feet (7600 m), where for every hour spent there, some of your brain cells are dying. Much of the above information was summarized from a very informative pdf: <www.montana.edu/everest/about/research.htm> by Dave Lageson, Professor of Geology at Montana State University. I also consulted the Wikipedia website; just Google "Mt. Everest geology." They have a short but very informative section on the geology of the mountain. For a very informative and well written article written by Miles Traer about the climbing history interspersed with the geology, as well as interesting geologic-related pictures of Mt. Everest, be sure to click HERE. I also consulted the Wikipedia website, just Google "Mt. Everest geology." They have a short but very informative section on the geology of the mountain.